WOW these are the best baked fries! Forget the awful bagged frozen nasty fries, you cannot get any easier or healthier than this, for added flavor I will toss on some fresh Rosemary or grated Parmesan, fresh ground black pepper is a MUST. 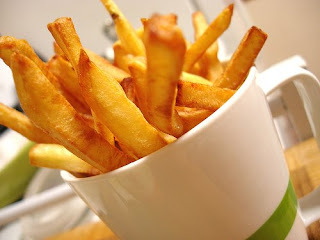 OH forgot to add, toss on some fresh chopped garlic and you have the best garlic fries EVER.. I prefer a baking stone but, you can line a jelly roll pan with parchment paper, works just as well. Slice potatoes into sticks and place in cold salted water, let sit 30 minutes. Strain and pat dry. Place potatoes in a large bowl and toss with oil and herbs, arrange potatoes on baking sheet, place in oven for aprox. 30-45 minutes depending on how crispy you like them.